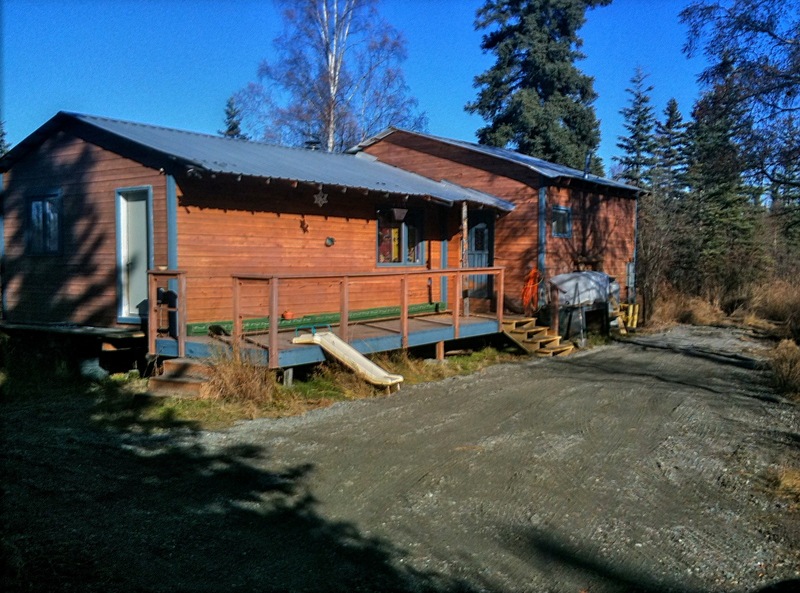 The cabin renovation is basically finished. It took much longer than I expected, but I don’t think we’ll have too much trouble finding a renter before winter really starts. The last thing we had done was to have the utility pole straightened and the power and phone cables buried from the pole to the house. When we bought the place, the utility pole had been forced out of the ground about four feet and was leaning at least 30 degrees. 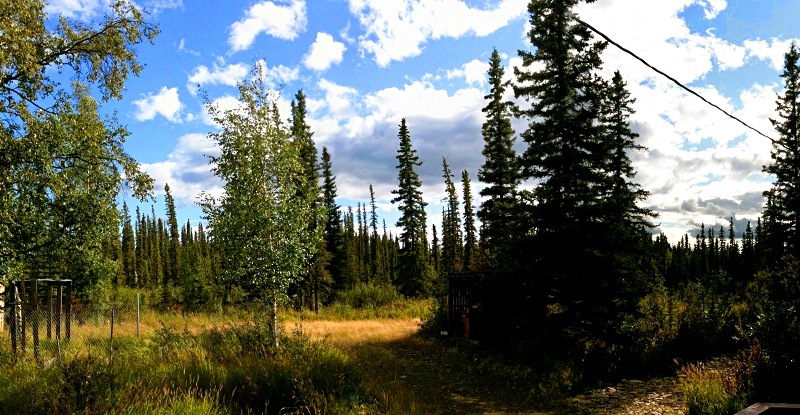 In addition, the overhead lines from that pole to the house dropped to within a few feet of the ground, and were connected to a second pole that was leaning in a tree. We decided it’d be better to just bury the whole thing past the service drop. Problem was, the day before the work was scheduled, we got 0.8” of rain and when they ran the trencher through the saturated permafrost, it turned the trench into a riverine mud pit. 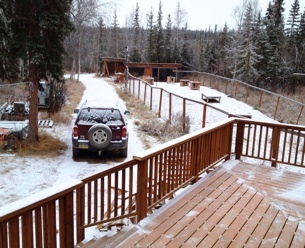 The trench ran right along the cabin, and essentially ruined the front yard and driveway area. Since I was having gravel delivered for our arctic entryway, I decided to get a full truck and have them deliver the extra to the cabin. It’s still a bit of a mess, but I’m hoping that grass and other vegetation will grow up through the gravel where our renters don’t drive on it. A series of photos taken during the entire renovation can be viewed at Cabin Renovation, Summer 2010. 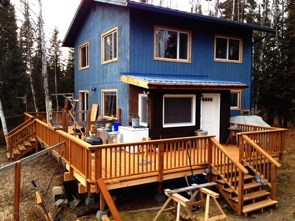 The new cabin is finally starting to take shape. All the vinyl flooring has been installed in the entry, bathroom and kitchen, and I’ve finished with the laminate flooring in the kitchen area. 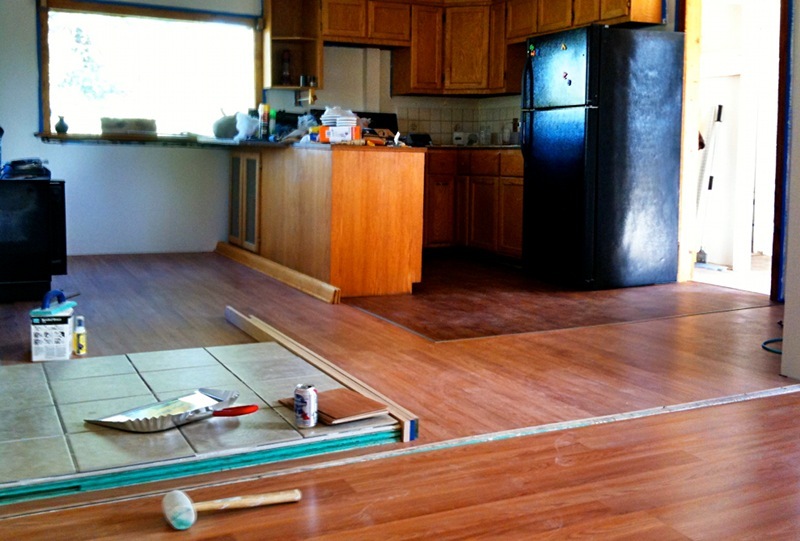 This morning I tiled the hearth, and started working on the flooring in the living room. It’s such a relief being done with all the painting. I also put the water tank back in the bathroom, so now there’s running water again. We got all the flooring for the cabin on Sunday. We had planned on sheet vinyl for most of the areas that could get wet, but a remarkably helpful employee at Home Depot suggested we use “vinyl plank flooring” instead. It’s similar to laminate flooring in that it comes in pieces that fit together to form a solid, floating floor. In this case, the individual planks have top and bottom glue strips on the edges so that they stick to each other. The glue is pressure activated and once the pieces have been fused together, it’s waterproof. The stuff is also quite thick and stiff, so it’ll go right over variations and defects in the subfloor. I did the bathroom installation last night. It’s difficult to get the seams completely tight, but when you’re not up close to the floor the variation in seams isn’t obvious. It’s also very difficult to cut, and I went through quite a few knife blades on this small room. Still, it’s much easier to install than getting a big sheet of vinyl to fit, and it’s so thick that it seems much more durable than even high quality vinyl. We got two different tile patterns for the bathroom and entry area, and a simulated teak for the kitchen. The rest of the place gets laminate flooring in a simulated oak. It’s not really high quality stuff, but good enough for a rental and will look a lot nicer than the old carpeting I pulled up a month ago. 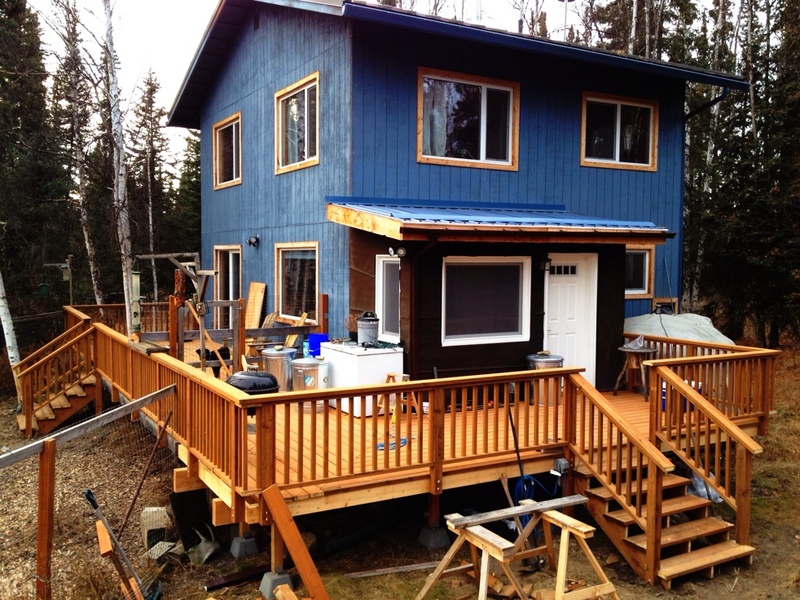 The cabin renovation continues. I’ve been working every evening, all weekend, and I’ve started taking Fridays off so I can get everything done before the summer is over. For the past eternity I’ve been painting. Once again, I rediscover how unpleasant it is to paint textured walls. Rolling on the paint isn’t so bad, but cutting in is brutal because you have to go over the same area over and over again with the brush to get all sides of each stupid frigging pebble of drywall mud covered with paint. The good news is I’ve gotten the entire place primed, and have completed the final coat on the ceilings, bathroom, and the two main rooms. Tomorrow I hope to finish with the rest, assuming I don’t run out of paint. 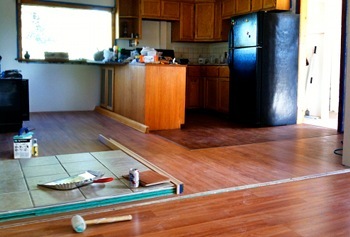 And then I’ll finally be able to do something fun: tiling the hearth, linoleum, and laminate flooring. We still need to pick out the flooring. 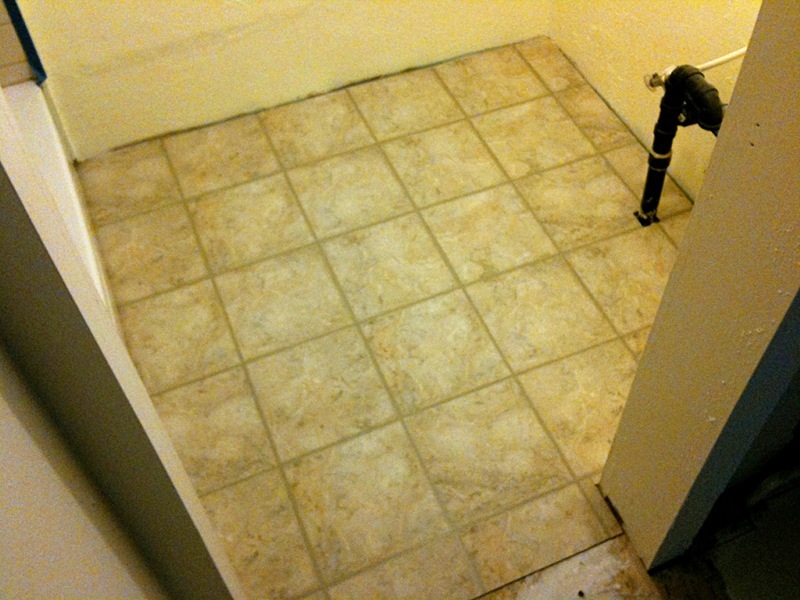 I’m thinking we’ll use two or three different styles of linoleum or thick vinyl for the bathroom, entry, and kitchen. Then a medium-light colored laminate flooring for the bedroom and living room. Hopefully we’ll be able to get all this stuff on Sunday. By then I should be done with the walls and can move on to the floor. The roof still looms in my mind, but I’m trying not to think about it until the interior is all done. I’ve been riding my mountain bike back and forth between the cabin and home, and the top image was what I saw on my way home tonight. The new property is on the right side of the road in the photo. 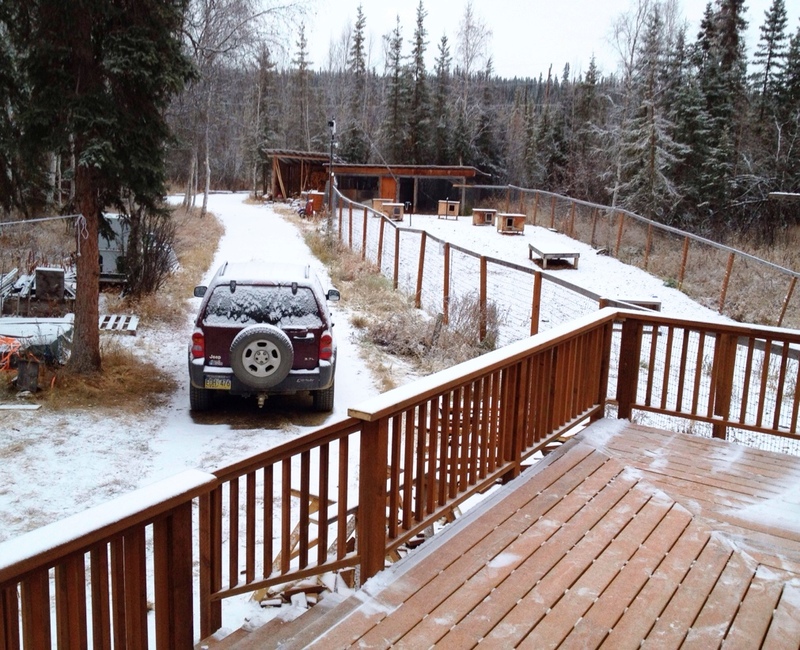 The photo below was taken off the deck at the new place.